Bangistan’s simplistic take on religious tolerance and racial profiling is shallow and boring, and the movie is unwilling to commit to an identity. Is it a comedy? A satire? A serious commentary on social issues? Even the lead actors seem to be performing in two different films. Satire would seem to be the obvious choice given Bangistan‘s plot, but it’s not presented with enough cleverness to count as such. With an international forum on religious tolerance on the horizon, radical Hindu and Muslim sects who profit from the enmity between the religions are in panic mode. Separately, each sect chooses a devotee to pose as the member of the rival religion and set off a suicide bomb at the conference, derailing peace plans. The Muslim man chosen to pose as a Hindu is Hafeez (Riteish Deshmukh), a disgruntled call center employee who’s sick of the people he calls assuming he’s a terrorist as soon as they hear his name. His unknowing Hindu counterpart is Praveen (Pulkit Samrat), a struggling actor and true believer in his guru’s cause. Both men train to impersonate someone of the other religion. Hafeez learns yoga, and vegetarian Praveen eats chicken. They both note passages urging non-violence in the religious texts they study, but it doesn’t make them question their assignments. Hafeez and Praveen end up renting rooms in the same boarding house in Poland, where the conference is to be held. They become friends, there are misunderstandings, blah, blah, blah. The story is stale, and it unfolds at a tedious pace. It’s hard to develop affection for the bumbling duo because it Deshmukh and Samrat seem like they are acting in different films. Deshmukh — by far the superior actor — plays Hafeez as cerebral and conflicted. Samrat’s Praveen is alternatively glib and fervent. He’s either completely unaware of his impending death, or martyrdom is the only the he wants in the whole world. Regardless, Samrat does everything at full volume. International audiences may not get a whole lot out of the mistakes Hafeez and Praveen make in their impersonations. A bit in which Hafeez nearly ruins a funeral by suggesting a widow immolate herself along with her deceased husband only works if you’re aware of the ancient tradition (and the bit isn’t as funny as it could have been anyway). The reductive approach the film takes to racial profiling is disappointing. In his disguise as the Muslim, Allahrakha Khan, Praveen is regularly asked if he’s a terrorist or if he has a bomb. Most bigotry is rarely so overt. Writer-director Karan Anshuman botches instances of more subtle profiling, too. When the customs official at the airport in Poland flags every Muslim in line for extra inspection, she recognizes Hafeez’s fake name — Ishwarchand Sharma — as Hindu and lets him through. I can’t speak for Poland, but I doubt that most Americans would be able to make such a distinction. To most Americans, “Khan” is a bad guy from Star Trek, not a terrorist moniker. At times, Bangistan is downright stupid. At one point, Hafeez and Praveen are caught in an explosion, and the movie cuts to various international news broadcasts reporting that two men died. This is supposed to prime the audience for an emotional reaction when Hafeez and Praveen stand up amidst the rubble, very much alive. How did the news channels get their information before people at the scene? Did no one bother to check if the men were actually dead? Why would they report a story they didn’t verify? It’s stupid, cheap, and lazy, just like the rest of Bangistan. This entry was posted in Reviews and tagged 1.5 Stars, 2015, Bangistan, Bollywood, Hindi, Indian, Karan Anshuman, Movie Review, Pulkit Samrat, Riteish Deshmukh on August 7, 2015 by Kathy. Interesting. I’m sat here in the interval typing this Kathy. The audience, apart from me, is all Pakistanis and they seem to be loving it. There’s been lots of laughing out loud. I’m just relieved that so far it hasn’t been unfair to any single religious belief as it could have turned ugly. I think the audience here is laughing because they can see the silliness in what is happening. Maybe by the end I will feel different but so far I am definitely enjoying it. Can’t understand why Pakistan and the UAE would ban it, but as I say, I haven’t seen it to the end yet. UPDATE: It sounds like I’m going to be on my own on this one, but I really enjoyed it. I thought it was thoroughly entertaining and carried with it many wonderful messages – and many of those messages are ones that the world desperately needs to heed at this moment in time. Yes they may have been made in a cheesy, roundabout way, but hey – they’re still important messages. I felt the premise of the story was an interesting one, that raised all sorts of crucial points, and that the build up to what was a great ending was woven superbly with all sorts of minor issues to deal with along the way such as lambs for Eid, alcohol, a love interest (or sorts), the immolate that you mentioned Kathy, and the way that each of the major characters had interpreted each others holy book. As for the name Khan, I think maybe the difference in ethnic populations between where you are and where I am, means you might not know, but I’m pretty sure 90% of people over here in the UK and the rest of Europe would know the difference between Khan and Sharma, and alas, that kind of ethnic profiling does go on all the time over here I think. I watched it in a cinema full of Pakistanis and heard many of them laugh out loud in a nice way – which was great to hear, as with this kind of film it is only too easy to offend or to shy away from offending – it is a fine line. I can see where you are coming from on some of your reasoning Kathy, definitely so, but I really enjoyed it and I got the impression the rest of the audience in the movie theatre I was in did too. Maybe that was because a lot of them were probably expecting it to be an out-and-out Muslim-bashing film (with a title like Bangistan, who didn’t? ), and the fact that it was a very fair movie with a positive message to all religions made them let their hair down a bit and enjoy it. England obviously has a much stronger historical link to India/Pakistan than the US, which accounts for why a movie like Bangistan has a more limited appeal here. I live in an area outside of Chicago with a very high Indian and Pakistani population, and it’s still only about 6%. Not that Excel Entertainment has to cater to me and my neighbors when they make a movie, but more context would help if they want to reach a broader American audience. Just noticed something interesting Kathy. If you go to an analysis of the ratings on IMDB you’ll immediately spot that over 60% have either given this movie 1 out of 10 or 10 out of 10, with the split being roughly 50:50. This shows people are VERY split about this movie, more so than most. My guess is that all the negative votes are coming from India and all the positive votes are coming from outside of India, and even guess that a lot of them are coming from, ironically considering Pakistan banned the movie, the UK where the Pakistani population is quite high. I think people who are in areas where there is quite a few issues regarding race relations, are seeing the merits of this film, whereas people where race isn’t an issue – maybe where you live Kathy – the film is just not at all relevant. As for the Indians not liking it, I can understand that as the movie does give the impression that Hindus are as bad as Muslims, and maybe that offends them, but if so they are very much missing the point and the important message that oozes through every pore of the film and culminates in the brilliant music video that was shown whilst the end titles rolled. 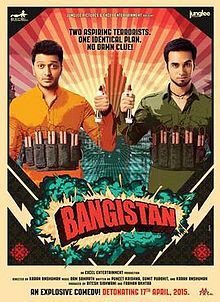 The US market for Bollywood films is really, really star driven, and Bangistan just doesn’t have the recognizable names people turn out to see. I don’t have the exact number of theaters that Bangistan opened in here, but I read that it may be in fewer than 30 theaters (whereas the median is around 75 theaters). If the theater count really is that low, than Excel isn’t expecting much from it here at all. Kathy, awaiting you review on Baahubali. I don’t know that I’m going to write a formal review of Baahubali, Avinash, but I saw it and enjoyed it.